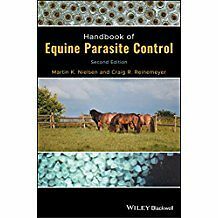 Handbook of Equine Parasite Control, Second Edition offers a thorough revision to this practical manual of parasitology in the horse. Incorporating new information and diagnostic knowledge throughout, it adds five new sections, new information on computer simulation methods, and new maps to show the spread of anthelmintic resistance. The book also features 30 new high-quality figures and expanded information on parasite occurrence and epidemiology, new diagnostics, treatment strategies, clinical significance of infections, anthelmintic resistance, and environmental persistence. This second edition of Handbook of Equine Parasite Control brings together all the details needed to appropriately manage parasites in equine patients and support discussions between horse owners and their veterinarians. It offers comprehensive coverage of internal parasites and factors affecting their transmission; principles of equine parasite control; and diagnosis and assessment of parasitologic information. Additionally, the book provides numerous new case histories, covering egg count results from yearlings, peritonitis and parasites, confinement and deworming, quarantine advice, abdominal distress in a foal, and more. Handbook of Equine Parasite Control is an essential guide for equine practitioners, veterinary students, and veterinary technicians dealing with parasites in the horse.